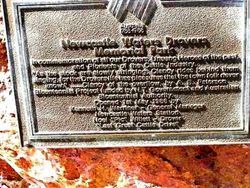 A park commemorates drovers and pioneers of the Cattle Industry and was established as a Bicentennial Project. In the early 1880s the pastoral lease at Newcastle Waters Station was taken up by Dr. W. J. Browne from Adelaide who had earlier established Springvale station near Katherine. Browne employed Alfred Giles to administer his extensive holdings and, as part of his managerial duties, Giles arranged for the D'Arcy Uhr to overland cattle from western Queensland to stock Newcastle Waters. This was done in 1883. Browne's pastoral investments failed and in 1895 he was forced to sell the Newcastle Waters Pastoral Lease to John Lewis of Adelaide. The Lewis family held the lease for over 50 years. All Northern Territory pastoralists were confronted with the problem of transportation. Inadequate stock routes meant that while cattle could be raised in the Territory it was almost impossible, particularly during periods of drought, to get them to the markets. Stock routes had been established but they were only as reliable as the rainfall - and that wasn't reliable at all. The famous overlander Nat Buchanan had pioneered the Barkly Stock route from the Overland Telegraph Line to western Queensland and in 1886 G. R. Hedley successfully traversed the Murranji track from Victoria River to Newcastle Waters. A few months later Nat Buchanan and Sam Croker took the first stock across the route. They were guided by Mudbarra Aborigines firstly to Murranji waterhole 80 km west of Newcastle Waters and then to Yellow Waterhole a further 80 km on. and Pioneers of the Cattle Industry.